As a WWE wrestler, John Cena is a fearsome force: He’s not only a three-time World Heavyweight Champion and two-time Royal Rumble winner, but the most public face of the WWE for much of the 21st century as well. But, as of now, he has officially completed his transition into a big ol’ teddy bear. “With Elbow Grease and the books to follow, I want to offer kids a fun and engaging way to learn about the power of ambition, dedication, and heart,” says Cena, presumably while wearing a “Rad Dad” T-shirt and picking up the living room. 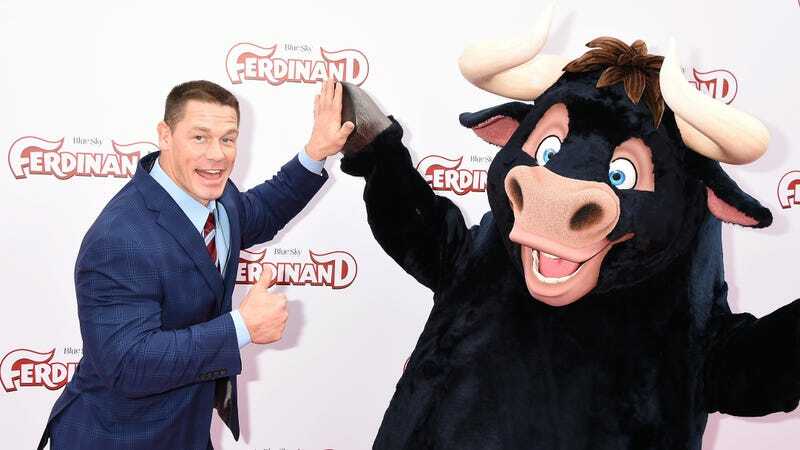 “These concepts have been transformative in my life, from my childhood up to now, and it’s so important to me to pass the positivity on and help our youngest generation see that right mindset is key to achievement.” There were no follow-up statements, because Cena was busy enveloping the press release copywriter with a tender hug and some recommendations for the best places to get lunch at The Wizarding World of Harry Potter. By the way, the monster truck’s name is Elbow Grease, and his bigger older brothers are Pinball, Flash, Crash, and Tank. John Cena came up with all those names. He is also set to host the Nickelodeon Kids’ Choice Awards for the second year running, the lovable galoot. Be sure to call out, “Show me that smile, Snuggles MaGee!” when you see Cena on the street. He likes that.